Whenever one mentions that they play the guitar, the image of a handsome youth with fancy hair singing and strumming pop songs on stage comes to mind. However, that’s not all the guitar has to offer! Raffles Institution’s Niibori Guitar Ensemble (RJGE), led by instructor and conductor Mr Michael Gaspar, welcomes you to another face of the dynamic guitar, where a whole chorus of up to 30 guitars blend harmoniously to tackle all kinds of tunes, from classical to Broadway. 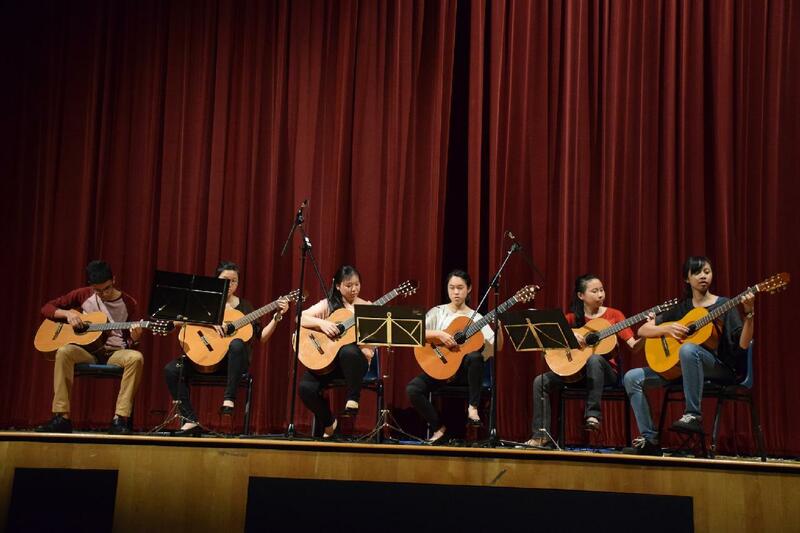 In 2014 alone, Guitar Ensemble participated in numerous activities and school events. 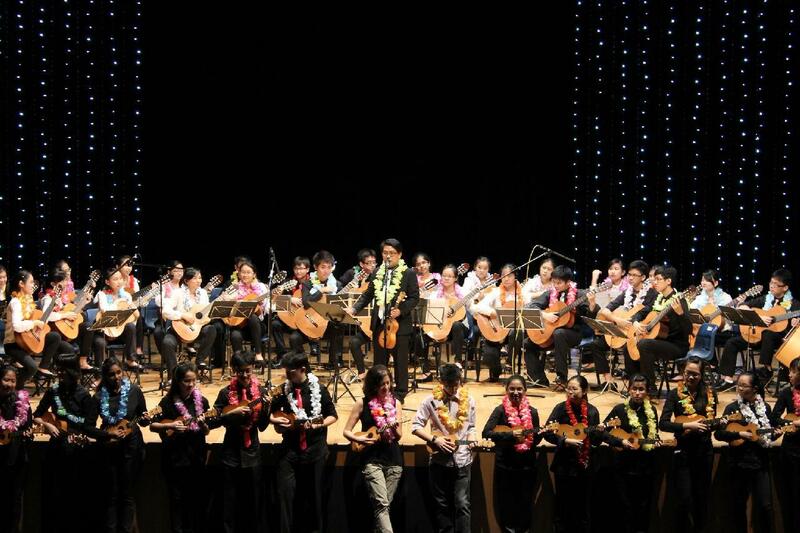 This included the 8th Guitar Ensemble Festival, where the main ensemble performed Scherzino Mexicano and Summer’s Wind, gaining favourable comments by the judges. They also presented a rendition of pop song Trouble by Taylor Swift as a small group item, ending the festival on a happy note. We also collaborated with Raffles Girls’ Guitar Ensemble to put up our annual concert Esperanza in May, where apart from the usual classical pieces we jazzed up our line-up with songs specially selected by our members, such as Itsumo Nando Demo from the classic animated film Spirited Away. The concert ended off with a bang as the main ensemble and junior ensemble, donning colourful garlands, collectively delivered a resounding Aloha Oe as a farewell song. Thanks to the amount of effort and perseverance put in during rehearsals, the main ensemble pulled off a resounding success with the performance. It was also the first opportunity for the junior ensemble to showcase all they had learned in the short time they had been in the ensemble. With help from instructors, teachers and familiar faces in the audience, the concert turned out to be a truly memorable event for all of us. In addition, RJGE was actively involved in school events, such as the 2014 Water Conference where we provided casual entertainment onstage during the participants’ last dinner together, as well as playing to our hearts’ content for a good cause at the ISLE concert in August. It was a blessing to have had so many opportunities to perform onstage as a team, and to have brought joy to others in the form of music. In 2015, more exciting events await us, including the Singapore Youth Festival in April, where we can finally display our efforts as an ensemble and as a team throughout our journey in RJGE. Our aim is simply to create wonderful and melodic music with fellow guitarists to produce an unforgettable experience. Guitar Ensemble welcomes anyone who is interested, regardless of musical background (or even the lack thereof! ), and lessons will be given by the seniors at the start of the year for any beginners. However, new members will be required to buy a classical guitar through the CCA if they don’t already own one. Practice is held twice a week, every Monday (5pm-7pm) and Wednesday (2:30pm-5pm), with extended hours, whenever necessary, for concerts and events.